Attention-deficit/hyperactivity disorder (ADHD) is commonly attributed to deficiencies in dopamine signaling, and most pharmacological treatments for the disorder target the dopamine system. However, recent studies correlate a genetic locus encompassing the stress-responses gene NDRG2 with ADHD susceptibility, suggesting that multiple pathologies may drive this heterogeneous disorder. Recently in the JCI, a study led by Lize Xiong and Yan Li evaluated the mechanisms contributing to ADHD-like behavior in Ndrg2-deficient mice. These mice exhibited impairments in glutamate clearance that led to increased excitatory signaling in the CNS. Although dopamine-targeting medications did not ameliorate ADHD-like behaviors in the Ndrg2-deficient mice, treatment with the NDRG2 peptide rescued their behavioral phenotype, supporting the idea that ADHD pathogenesis can occur via non-dopaminergic mechanisms. 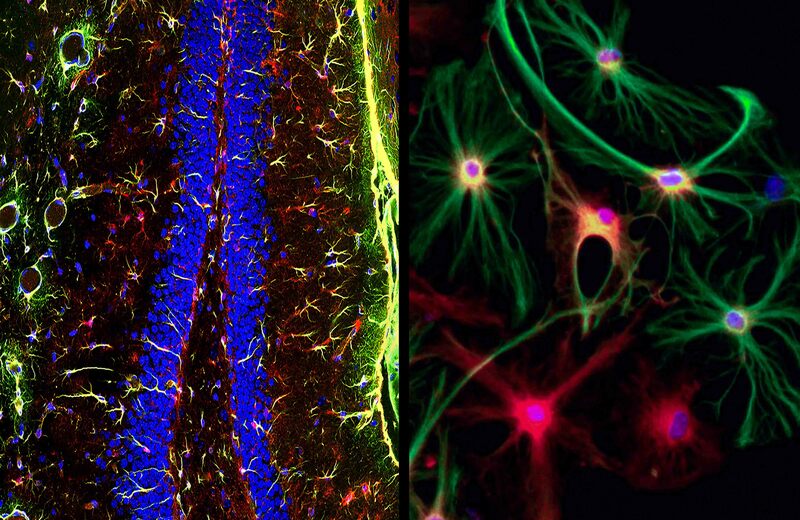 The highlighted images depict the expression of NDRG2 (red) in astrocytes (green), with nuclei indicated in blue. The left image shows the organization of NDRG-expressing astrocytes in the hippocampus of a wild-type mouse. In the image to the right, a closer view shows the colocalization of NDRG2 expression with GFAP (green) and nuclei in cultured astrocytes. Citation Information: J Clin Invest. 2017;127(12):4270-4284. https://doi.org/10.1172/JCI94455. Attention-deficit/hyperactivity disorder (ADHD) is a prevalent psychiatric disorder in children. Although an imbalance of excitatory and inhibitory inputs has been proposed as contributing to this disorder, the mechanisms underlying this highly heterogeneous disease remain largely unknown. Here, we show that N-myc downstream-regulated gene 2 (NDRG2) deficiency is involved in the development of ADHD in both mice and humans. Ndrg2-knockout (Ndrg2–/–) mice exhibited ADHD-like symptoms characterized by attention deficits, hyperactivity, impulsivity, and impaired memory. Furthermore, interstitial glutamate levels and excitatory transmission were markedly increased in the brains of Ndrg2–/– mice due to reduced astroglial glutamate clearance. We developed an NDRG2 peptide that rescued astroglial glutamate clearance and reduced excitatory glutamate transmission in NDRG2-deficient astrocytes. Additionally, NDRG2 peptide treatment rescued ADHD-like hyperactivity in the Ndrg2–/– mice, while routine methylphenidate treatment had no effect on hyperactivity in these animals. Finally, children who were heterozygous for rs1998848, a SNP in NDRG2, had a higher risk of ADHD than children who were homozygous for rs1998848. Our results indicate that NDRG2 deficiency leads to ADHD phenotypes and that impaired astroglial glutamate clearance, a mechanism distinct from the well-established dopamine deficit hypothesis for ADHD, underlies the resultant behavioral abnormalities.